I am officially certified to teach young learners and teenagers as of the 19th of July when I received my certificate and reports. My marks and tutor feedback were quite positive. I received 17 out of 38 Above Standard marks, and the remaining 21 marks were Standard. I felt a wonderful sense of achievement when my tutor handed me the papers knowing how much work I put into it and knowing that I’ve been applying everything I learned in the classroom with good results. It was a tough 3 months and it’s hard to believe that it started nearly 6 months ago, but I definitely feel that I have improved as a teacher. I’m thankful to everyone who supported me in this undertaking. 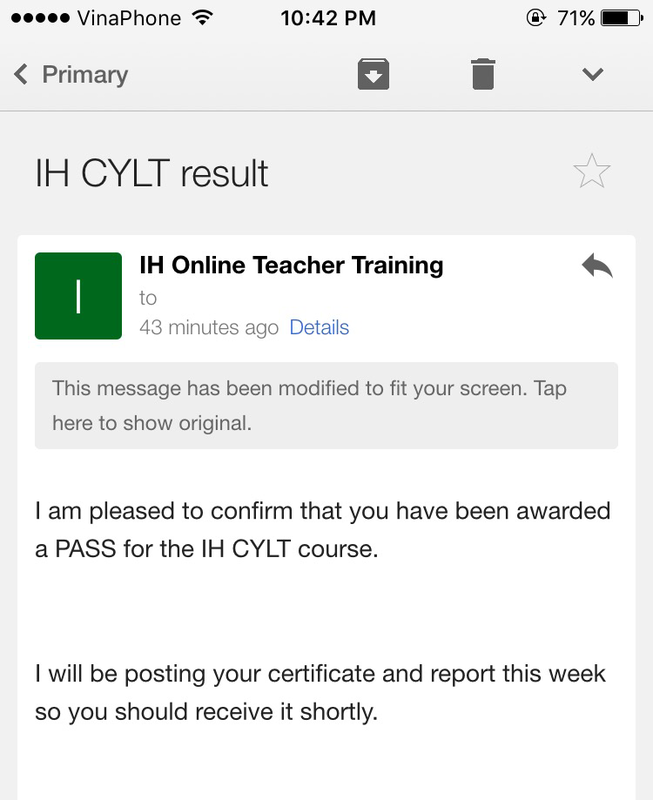 I am nearly at my 2 year post-CELTA-classroom-teaching-experience mark. This means that I can apply for more jobs, particularly those that ask for this specifically. With that and my YL qualification, finding employment should be much easier after I move on from Vietnam. I have been living in Vietnam for 11 months now, fast approaching a year. This also means that I’ve been living and working abroad for almost 2 years. It doesn’t feel like it’s been a year in Vietnam or 2 years away from home. Time is flying.